Tulip Fashion Glitter sheets open up a world of DIY possibilities. They can be punched and cut into all sorts of wonderful shapes, layered up and ironed on to t-shirts, pillows, throws, jackets, curtains and more. I was inspired again by my favorite vintage Christmas ornaments, this time playing with the iconic mid-century modern shapes. 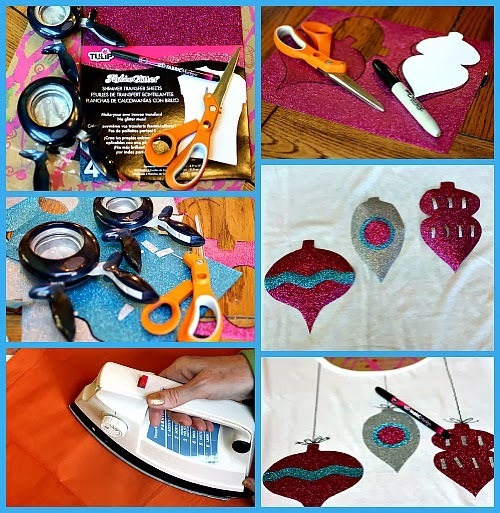 Just cut some out of paper (you can find templates online if hand drawing isn't your thing,) trace and cut the sheets, punch and cut accents, layer it all up and iron it on. 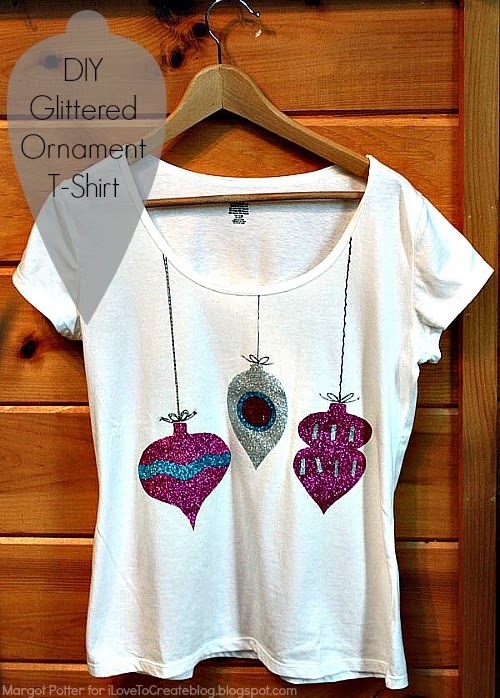 UseTulip fabric markers to add a few hand drawn details and you've got a boutique chic one of a kind DIY t-shirt that teens will love! Step one: Gather your materials. Step Two: Cut ornament shapes out of plain paper, use these as templates to trace and cut the glitter sheets. Mark on the slick cover with a permanent marker, the cover will be peeled off after you cut it out. Cut shapes, peel off cover! Step Three: Punch and cut your accent shapes. Step Four: Slide a Tulip Fashion Form inside of shirt to provide a flat surface for ironing. 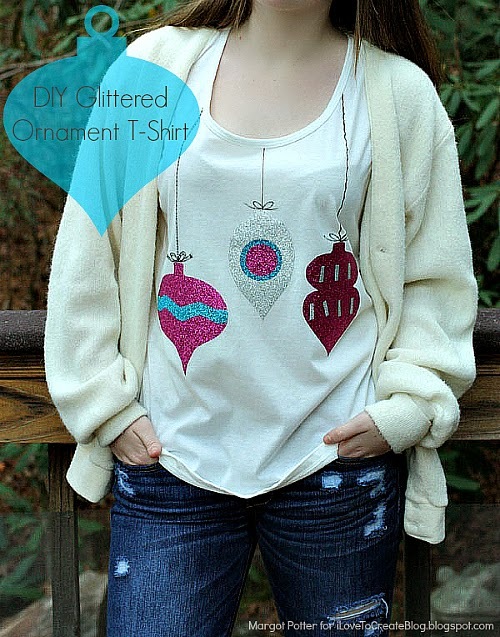 Remove the slick plastic cover on the shapes and layer your ornaments and accents up on the shirt. Step Five: Set iron to proper setting for cotton shirt, use pressing fabric over the elements and press each shape for 40 seconds. Keep the iron moving. Check to be sure the shapes are adhered, iron again if needed. Step Six: Use the side of the Glitter Sheets cardboard or a ruler to draw straight lines from the collar to the top of each ornament. I made each one a little different. Add a bow. That's it! We'd love to see what you do with our Tulip Fashion Glitter Sheets! Join the crafty conversation on Facebook. Visit me at my DIY craft blog The Impatient Crafter! This is wonderful. Great for the hostess, the teen queen, or as a gift. Love this one. I am loving this! I so hope that i have time to make some!!! I love this! 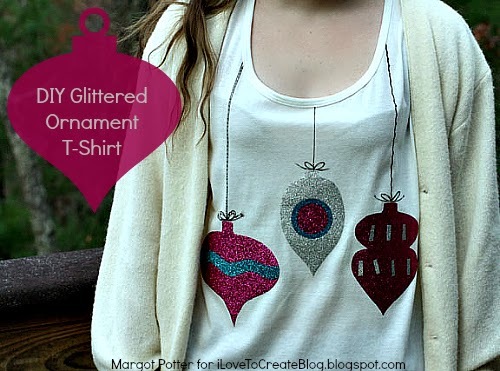 I might use a similar idea to make an ugly Christmas sweater! Nice post! These are beautiful printed t-shirts. Every t-shirt is unique and has superb design. The coolest women's rock t-shirts on the planet of the sun.